I need to get up earlier in the morning. I first started blogging in 2004 on a Blogger site, and recently took a look at the first post I published, from April 22, 2004. 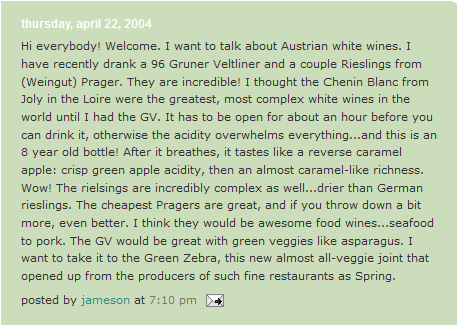 I was surprised to see that I had written about Prager Gruner Veltliner and Riesling (from Austria), which I was introduced to at the time by my coworkers at Randolph Wine Cellars in Chicago. (I was working there part-time.) And though my blogging debut may have been about wines with serious geek cred, I recall a few (well, maybe like 6) years earlier when I enthusiastically and pleasurably drank oceans of cheap California Chardonnay I bought from the bodega down the street from the ugly high rise I lived at in the Uptown neighborhood. My inaugural post lacked a photo and, for me, showed remarkable restraint in the use of exclamation points and parenthetical asides. (I could learn a lot from that thirty-something kid. Seriously! Well, except where I misspell “riesling.”) I also recalled my utter incomprehension about how the internet worked. (That is something that has not changed.) I figured I had zero readers, and only could tell that I had one if they commented on the blog. I never looked at stats (were they available?) and I didn’t know SEO from a CEO. But really, my blogging has remained remarkably consistent over the years. I have, however, put the snark away and made a commitment to blog with a positive outlook. It is important for me to focus on highlighting what I find unique, interesting, exciting, and delicious. Sometimes, all four things happen at once, which is pretty magical. 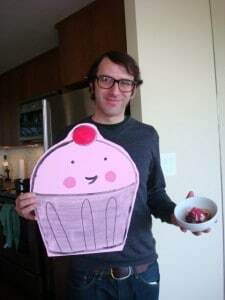 Speaking of magic, I’m not above posing with a giant, anthropomorphic cupcake if it will help get the word out about wine. (Thanks, CakeSpy, for the photo.) What’s less surprising than me with a cardboard baked good is that I’ve got my usual t-shirt and jeans garb, only augmented by a v-neck sweater. I like to think that, like my (ahem) “style”, my wine writing remains comfortable, even if the subject at hand lends itself to a certain fancy-pants-ness. Congratulations!!! I just voted. You are my favorite wine blogger. Thank you, Audrey! Nice to see you outside the Melrose Market recently. Well deserved, my friend. 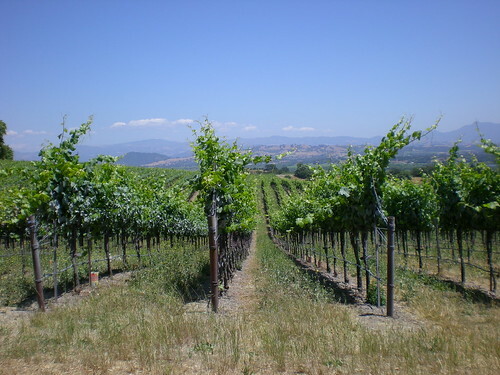 From the first time I read one of your posts I recognized that you have a talent and outlook that is rare among wine bloggers. I am so excited to see you generating so much buzz and success in 2012, and I wish you continuing success in all of your endeavors. You have my vote, as you are one of the few bloggers that I read with any consistency. Still hoping we can meet up for a drink one of these days when I’m on the West Side (or perhaps here on our side of the mountains some time.) Cheers! Thank you so much for your kind words and support. Happy to meet up on this side or your side of the mountains.